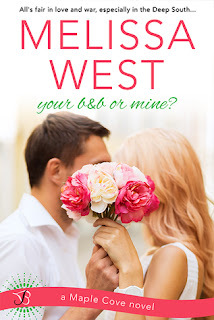 I am always looking forward to another Melissa West book, so when I saw this one, I knew I wanted to read it! It sounded super cute with a small-town vibe and I just love those! Sure enough, it was just what I needed to snuggle up with as the weather turned colder and the days shorter. It was a cute, sweet read and I enjoyed seeing Logan and Savannah try to maneuver their way around one another... and their lingering teenage feelings! My heart was broken for Savannah as she is forced to come back home to Maple Cove to do the unimaginable: make funeral arrangements for her mom. Having lost her father already, the Hales must lean on another during such a difficult time. Savannah, as the eldest, feels a responsibility to be a source of strength for her siblings, but that is a challenge, as she is wrecked herself. In addition to this, her family's B&B is in financial trouble and while none of them ever really wanted to run it, it strikes up some nostalgia when it comes down to letting it go. I liked Savannah's character and I can't even imagine how she feels during this time. She feels immense guilt after leaving behind the small town of Maple Cove, after she got her heart broken so many years ago by her former boyfriend's best friend. She feels like she's missed valuable time with her mom and that really hurt my heart. Savannah isn't the only person who's returned to Maple Cove. Logan Park has too and he just so happens to be with the company that wants to buy the B&B after it goes into foreclosure. Between that and Savannah's heartbreak over his suddenly leaving her all those years ago, things between the two are not the easiest. In fact, the two squabble quite a bit. Savannah has a hard time keeping her cool with him and the feelings he invokes in her certainly don't help either. Logan isn't a bad guy though. He was put in a difficult position when it came to his feelings for her, as she was his best friend's girl. After losing his best friend in the military, the two leaned on one another during such a painful time and eventually couldn't fight the attraction either one felt. However, Logan carries some serious guilt over his best friend's death, how it happened, and how he should proceed from there, so while hurting Savannah was the last thing he wanted, it was the one thing he knew he had to do in hopes she would move on and find someone different. Savannah and Logan have serious unfinished business when it comes to one another. Savannah can try to mask her feelings with anger, but at the root of it is her heartbreak over a boy she really cared about. I was a bit conflicted over Logan's intentions at being back in Maple Cove. He knows he needs to keep his distance from her because of his former best friend, but he also wants to be the one there for her, as she is going through such a hard time. They have some really sweet, tender moments together and I was rooting for these two to confess their feelings for each other. However, I didn't understand why he made the decision he did in the end. It was corrected fairly quickly, but just seemed like added conflict that I think we could have done without. Overall, I thought this was a cute story and I loved the small town Gilmore Girls feel. I can't wait for more books in the series and I really hope we get stories from Savannah's siblings, Leigh and Jack! I'm a bit behind so I just started this one last night, but it got off to a good start. Surprisingly the one who caught my attention first was Leigh, there is just something about her. Can't wait to finish this one up. Great review! I normally really like Melissa's books but this one didn't work for me sadly. I thought they fought with each other for too long and I wanted more from the characters. The setting was interesting though and I'm looking forward to the sister's book. Glad you enjoyed this one so much, Jess! :) Lovely review! I'm not sure I could pass up a book with a small-town Gilmore Girls feel! Glad you enjoyed this and thanks for the review. I've had my eye on this one. You know how I love my small town, sweet romances. You might've just convinced me to pick it up. :) Great review!